Here in the U.S., body pillows are more like regular pillows, only longer. They're also not as important, although I find sleeping with a body pillow is comforting, like cuddling a man that doesn't snore and judge you for wanting to cuddle all the time. My body pillow from Target was one of my most coveted bedroom items, except that as years flew by, it got flatter and flatter, like my chest. My sister said "new pillow time!" But I wasn't ready. My body pillow and I had a long healthy relationship. Fortunately longer than my relationships with men. So I hung on to the old body pillow and came up with a brilliant plan to fatten it up. I had an old comforter that I loved dearly. We also had a long relationship. Unlike the body pillow, the comforter was a goner. The cats destroyed it. I couldn't bring myself to save it, but it was in such a crappy shape that I don't think thrift stores would even take it. If I threw it away, my mother would drag it back to her house because she dumpster dives and hoards everything. I was in a pickle, so I decided to take the innards of the comforter and stuff it into the pillow. Some relationships can be salvaged. Others can't. But it doesn't mean I must say goodbye to both completely. That's not to say that you should cut up your good comforter just to save a body pillow. There's no reason to destroy a good relationship just to improve another. 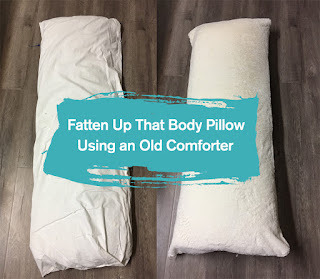 But if there's an old comforter or pillows lying around that house that you could use to resurrect your flat body pillow, give this method a try. Flat pillow, almost naked in all its glory. Once beautiful, now crappy comforter, like an old supermodel. Beauty is never forever. Snip off one end of the pillow to expose the innards. Snip open the comforter to expose the innards. Fold the comforter innards to match the shape of the body pillow. Pile it on top. Or below. Whatever floats your pillow boat. I did an extra step and serged the edges of the pillow case. Optional. Stuff the innards into the beautiful body of the pillow case. BAM. Full and beautiful. Who said skinny is beautiful? Not me. I've made myself the perfect man pillow that won't snore and complain when I cuddle him.